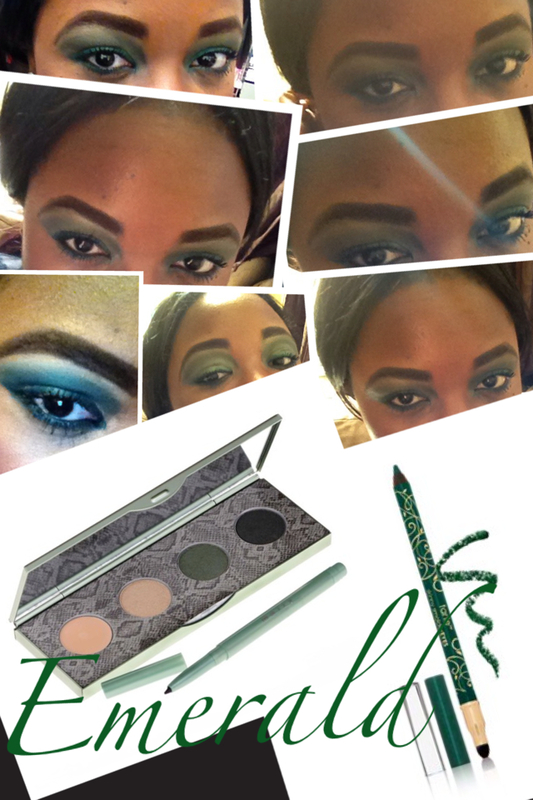 Mally Beauty City Chick Smokey Eye Kit in "Central Park" and Tarte Cosmetics skinny smolderEYES™ Amazonian clay waterproof liner in "Emerald" was used in the eyelooks above. Emerald : The official color of 2013 as declared by Pantone. Since January, I have been looking for beauty items to incorporate in my beauty regime. A BIG fan of Mally Beauty,Tarte Cosmetics and ZOYA Nail Lacquer so it was only natural that I would choose favorites from these brands. For eyes : I did one look solely in Tarte Cosmetics skinny smolderEYES™ Amazonian clay waterproof liner in "Emerald" ( pictured , bottom left) , and I just love the texture and high pigment of this pencil. If you are not big on the whole eyeshadow application process, this pencil is all YOU NEED! I really love how the green pops! An added bonus, in my makeup exploits, I have discovered that the Amazonian Clay waterproof eyeliner in "Brown" works GREAT on the brows - ( pictured, in all the photos above - currently discontinued , but the best possible match is the skinny smolderEYES in "Moonstone Brown" or the Amazonian Clay Waterproof liner with double-ended brush - you have to be a bit advanced in the Brow Department to maneuver this brush to create a Brow - its not hard to become a Pro !) . I am just not sure if that shade is still available , I hope so ! My full on EMERALD EYE in all of the pictures above minus the close up eye shot , is a mix-up of brands and greens I used Mally Beauty City Chick Smokey Eye Kit in "Central Park" on the entire eyelid ( all components of the kit - base, lid, highlight and crease) , and topped it off with the skinny smolderEYES in jade around the eyes ( upper and lower lash line - with a bit of smudging with the sponge tip). I made a trip to Sephora the day I wore this look , and I got so much compliments in store and just throughout the entire day. This is the perfect pairing of Emerald Green shades and it really compliments dark skin ( as I am in the darker skin range). You can finish the eye look with Mally Beauty Ginormous Mascara in "Black" - it really gives the appearance of falsies ( as you can see in the pictures above). Another honorable mention for this look - Tarte Cosmetics BB tinted treatment 12-hour primer Broad Spectrum SPF 30 sunscreen , it gives a flawless light finish to the skin. 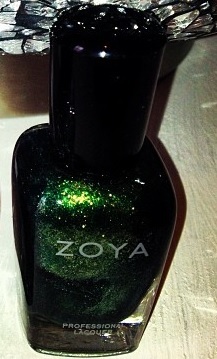 For Nails: Zoya Nail Lacquer in "LOGAN" , part of the Holiday 2012 Collection, this electric, sparkly , metallic green shade is just fun! Worn alone or as a top coat on another shade there is a lot of possibilities for this color! These are my current "Emerald" favorites, but its only the third month in the year, so I will be adding more to the list!